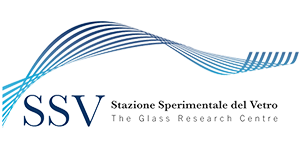 The laboratories of Stazione Sperimentale del Vetro have the most complete equipment for the mechanical characterization of glass containers, and SSV’s expert technicians and engineers can support the glass industry in the choice of the most appropriate standardised test methods, in the possible definition of custom test procedures, and in the interpretation of analytical results. The fragile nature of glass requires the evaluation of the reliability and mechanical resistance of the products to be carried out on a sufficiently representative statistical sample. The measurement of the resistance of bottles and vials to internal pressure stress is of particular importance in the case of containers destined to contain carbon dioxide rich beverages (like soda-pops, beer, sparkling wines, champagne, etc. ), but is often applied also to other containers as it is capable of subjecting the entire bottle to tensile stress (resulting from the hydrostatic pressure), which benefits the reliability of performance control, since this way all possible defects / stress concentrators are severely stressed. The test is carried out according to the UNI EN ISO 7458 standard: 2004 Glass containers — Internal pressure resistance — Test methods, or according to method B of ASTM C 147-86 (2005) Standard Test Methods for Internal Pressure Strength of Glass Containers. Both during the production cycle, during transport or during service life, glass articles are repeatedly subjected to impacts with each other or with other objects, so the resistance to this type of impulsive stress is of crucial importance to define the level of performance and safety. The mechanical test is carried out according to the UNI 9302:1988 standard. Unlike the internal pressure test, the determination of impact resistance can also be carried out on wide-mouth items such as vases and jars, as well as on glasses and pitchers. Resistance to rapid temperature variations is particularly important in the case of pharmaceutical or food contact containers meant to be filled with hot/cold liquids (e.g. tomato sauce), or to undergo thermal cycles of pasteurization, sterilization or freeze-drying (lyophilization), or for the kitchen tableware. The test for the determination of the resistance to thermal shock is carried out by completely immersing the glass articles in thermostatic tanks containing hot water (hot bath) or cold water (cold bath), and moving them quickly and repeatedly from one to the other according to a pre-established time schedule; the greater the number of cycles withstood without breakage and/or the greater the temperature difference between the two tanks necessary to break the samples, the greater the resistance to thermal shock of the articles. By appropriately regulating the temperatures and the test times, the test can be carried out in accordance with method B of the UNI 9303:1988 standard Glass containers. Test of resistance to temperature changes, or according to UNI EN ISO 7459:2004 Glass containers. Resistance and durability to thermal shock, or ASTM C 149-86 Standard Test Methods for Thermal Shock Resistance of Glass Containers. In the case of borosilicate glass articles or those that have undergone a toughening treatment, generally resistant to temperature differences of more than 90 °C, the test is carried out according to method A of UNI 9303, which prescribes the use of a muffle oven instead of a hot bath. The resistance of the containers to axial compression loads is a particularly important property in the capping phase or during storage in stacked pallets. Its determination is carried out according to UNI EN ISO 8113:2004 Glass containers. Resistance to vertical load. Test method. The production, packaging and filling lines induce a progressive deterioration of the mechanical resistance of glass containers, due to the continuous shocks and scratchings induced between them or with the plant equipment. 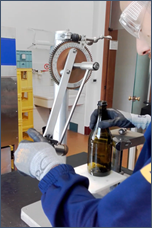 In order to simulate this characteristic damage, called scuffing, Stazione Sperimentale del Vetro is equipped with a special instrumentation called Line Simulator, inside which several bottles are put in rotation around their own axis, and in revolution around a carousel, thus substantially simulating the operating conditions of a typical bottling line. By carrying out mechanical tests on a statistically representative number of containers of the same batch, either or not subjected to the line simulator’s damage, it is possible to appreciate the deterioration in mechanical resistance induced by scuffing phenomena.